After quite a lengthy hiatus from my blog and cooking for that matter (sadly my diet has been largely fast food for the past couple months) it feels good to be back in action. It feels even better to have made my very own batch of the candy of meats, bacon. Making bacon has been on my list for quite some time, but it always seemed so difficult and scary, well it was neither difficult nor scary, in fact it was very rewarding and dare I say tasty. Before I could make bacon I had some fears to overcome in the process, maybe not fears but decisions. I did not want to use any nitrates or nitrites in the process, which is scary at face value because nitrites, sodium nitrite particularly, and nitrates are used in meat processing and curing to prevent botulism. 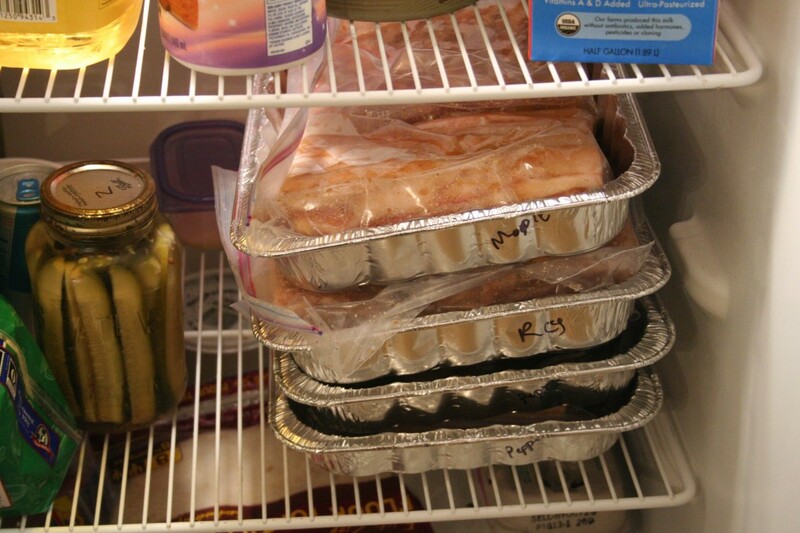 Botulism is like cancer, no one wants it and everyone is scared of it. 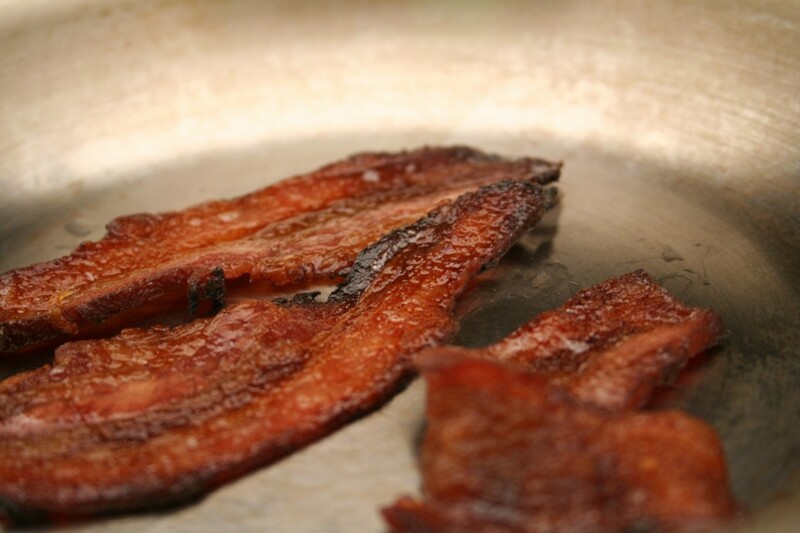 The problem with using nitrates and nitrites in the curing process is that nitrites when exposed to high heat in the presence of protein, think frying bacon which has been cured in sodium nitrite, the proteins in the meat bind with the sodium nitrite to form nitrosamines. Unlike sodium nitrite which is recognized as generally safe when consumed in small quantities, some nitrosamines have been proven to be carcinogens. So the options are botulism or cancer then right? Well not so fast, sodium nitrites are necessary in large commercial meat operations where there are numerous individuals handling the meat using various machines. I contend that at home there is much more control over who and what are used in the processing of meat. Like any other home cooking or canning exercise a good measure of cleanliness and attention to proper handling and sanitation will go a long ways in eliminating the need to add toxins to keep the meat botulism free. With that said continue at your own risk. As part of my operation everything was either new in package that was used (zip locks, foils pans) or sanitized in the dishwasher or cleaned with a bleach solution prior to contact with the meat. Hands were washed regularly (with proper technique) and an alcohol based hand sanitizer was used just to be safe. Overkill maybe but I suffer from Mysophobia. If all of that is too much and you want to be safe just use some sodium nitrate, it won’t taste the same but it should at least provide a little more comfort, it is often sold under the names pink salt, curing salt, instacure and Morton® Tender Quick® among other names. Be sure to follow the dosing instructions carefully when using these as they are toxic in large amounts. 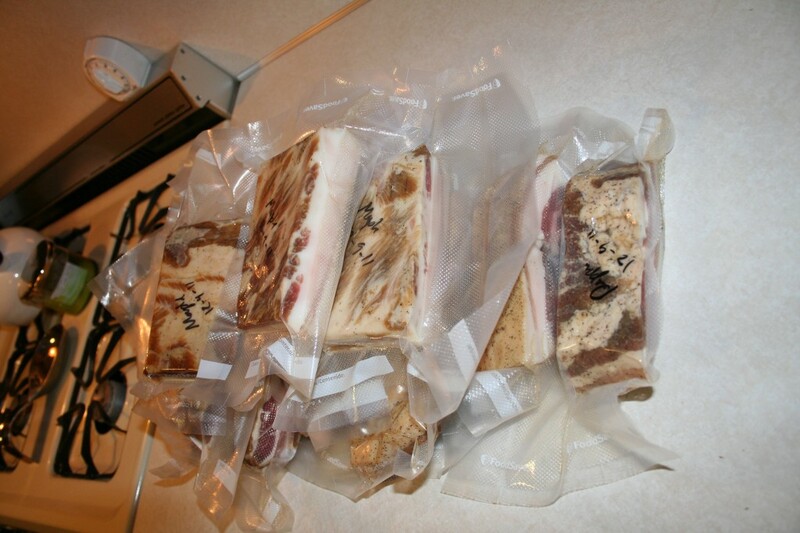 So with all of that business out of the way I decided I would not use nitrates or nitrites in the curing process and would be extra vigilant in the processing, curing and smoking of my bacon and I am glad I chose to go this route, the end result is phenomenal. 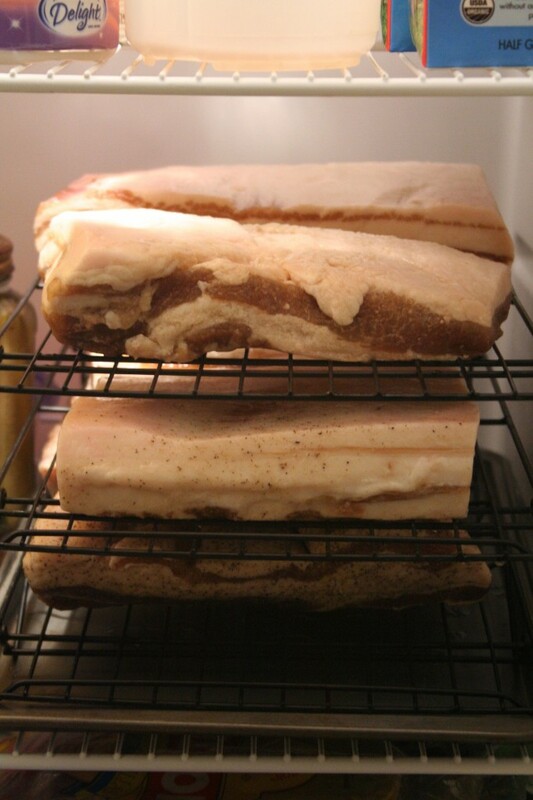 I started out with a 13.54 lb chunk of pork belly from my cousin, she had a hog slaughtered a while back and had kept the belly in the freezer with hopes of having bacon made. Keeping with the cautious side I had wanted to wait until daytime temperatures were set to max out around 40°F so I could truly cold smoke this and not have to worry about getting up too far into the scary temperature range. First I chopped the belly into three fairly even chunks, I had three variations I wanted to try. Next I mixed up my three cures they were all pretty simple and started with the same base recipe which can be found below, the recipe below is good for 3-5 pounds of meat. The most important part of applying the cure is that it is applied evenly and thoroughly. In addition I made two alterations to the base recipe to one I added 1/2 cup of real Michigan maple syrup and the other I added about a tablespoon of ground black pepper. Once I had all three of the cures made up I took care to rub them on their corresponding pieces of meat making sure to get it in all the nooks, crannies and crevasses. Once this was done I sealed up the meat in gallon zip lock bags getting as much air out as possible and then placed them in labeled foil pans in the refrigerator for seven days. Each day I flipped the bags over, it was amazing how much liquid the salt pulled out even the first day. As the days progressed the liquid continued to accumulate in the bags and the meat continued to firm up. On the seventh day I removed the bacon from its home in the bag, rinsed it under running water patted it dry and placed it on a set of drying/cooling racks over a cookie sheet in the refrigerator. 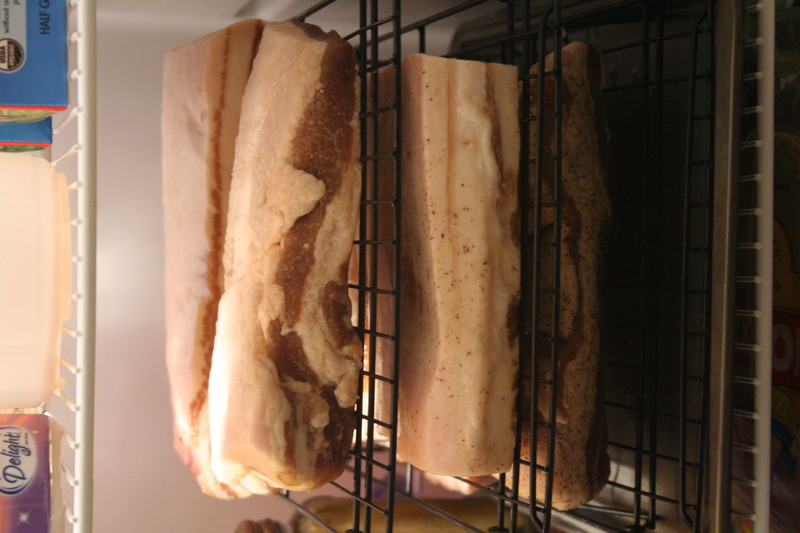 In our home the are used for drying racks for smoked meat as much as they are for cooling racks after baking. 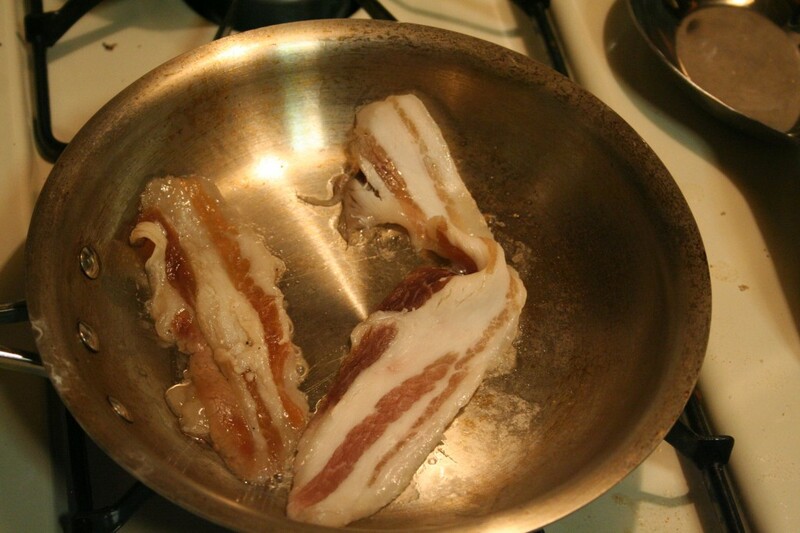 I digress, something else happened on that seventh day that was magical, this is a must, I sliced off two pieces of the bacon and fried them up to check for their saltiness and a flavor to see if anything needed to be adjusted. This was a semi alarming process to be completely honest, the bacon started to cook like bacon then all of a sudden it turned GRAY! Subconsciously I knew this would happen, it had no nitrates to give it the nice red color I am used to be it still took my by surprise, a few moments later it did turn a nice rosy color as it cook and the fat sizzled. Then it was time to try, I was a little apprehensive, what if it was terrible? It wasn’t it was salty, but not too salty and the maple bacon, it was like candy- sweet, salty and mapley, it was good. At this point had it been too salty I would have soaked the bacon for an hour in cold water, rinsed, dried, fried and then put them in the refrigerator to dry if all was well. After a good 24 hours in the refrigerator to form a pellicle, it should sit in the fridge for 12-24 hours but truth be told I didn’t have much of a chance for anything but 24 hours, I pulled the bacon out of the fridge, put it in the smoke house and fired up the smoke house. The bacon was smoked for 12 hours using hickory and apple wood chunks, I also did some cheese in the smoker during the same time for good measure. During the time it was in the smoker I monitored the temperature of the smoker constantly, I ended up having to put a house fan our in the garage on the firepot because despite the fact that it never got over 25°F, I had a hard time keeping the temperature in the smoker near 40°F like I had hoped. My over fascination with keeping the temperature that low was likely that just an over fascination but none-the-less I did. Early on in this whole process I made sure to save a couple of smaller chunks of meat to mix in and pull out throughout the day to test for smokiness, this was a mistake. Mostly because the chunks of meat were so small that they got really smokey, too smokey really quick and I got worried. I figured the smokiness would mellow as the bacon aged, like cheese does after a smoke but I was still worried. So when the fateful hour came to kill the smoker I started to get anxious. I killed the smoke and left the meat sit in the smoker for another couple hours to come down to a near freezing temperature slowly. Then it happened. Bacon. I took the bacon out of the smoker and brought it in to a once again meticulously sterilized work environment and began chopping it in to appropriately sized pieces of about a pound and chopping off a few slices here and there to try. In the interest of perfection and not making my house smell more like a find smokehouse I cooked the bacon in the oven, this is cheating but delivers perfect bacon every time. Because it was in the oven I am not sure if it ever turned gray or not but when it came out and sat for a few minutes it smelled like bacon, it looked like bacon and it tasted very little like the chemically altered pork you find at the supermarket, it was phenomenal. It was sweet, it was salty, it was smokey and most of all it was bacon. It was the candy of meats. Number one on the periodic table of meats without question. And the maple was still the best, all it needed was a pancake and some syrup to go with it. At the end of the day we ended up with a literal pile of bacon, a big smile on my face and a delicious plate of bacon to be sampled. We also ended up with a renewed understanding of why bacon is the candy of meats, it can be so sweet, salty, smoky and necessary. On more accomplishment on the Nate’s must do everything at least once list, but this one will end up on the why can’t I do this weekly list I have a feeling. It was good to be back in action and there is no better way to come back than with bacon. 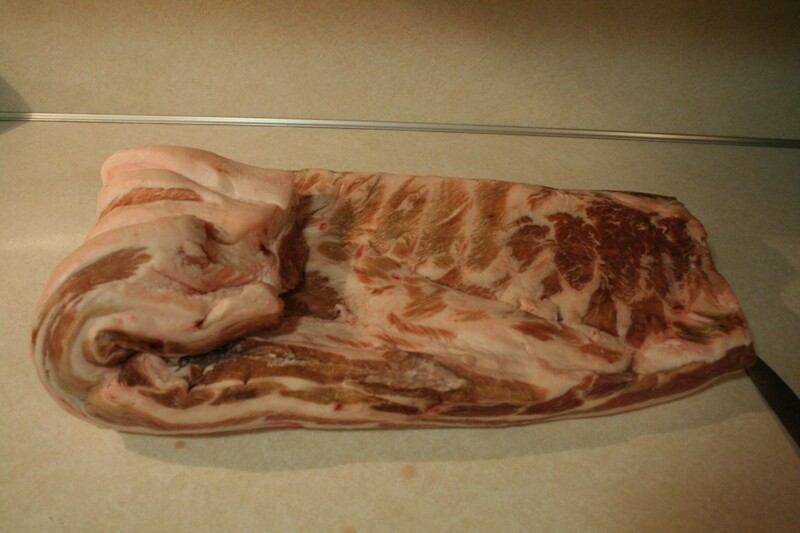 Here is the recipe for the basic bacon cure, this will make enough for 3-5 pounds of raw pork belly depending on how thick it is. The thicker it is the farther it should go.